Every school’s a stage when Penobscot Theatre Company is involved! Book a school residency and we’ll do the traveling: no bus, no fuss. Make your school dramatically different! Our school residencies are designed to complement your curriculum to help achieve Maine Learning Results. 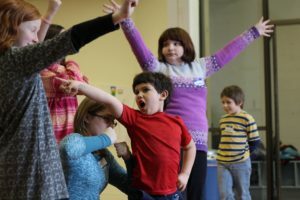 Penobscot Theatre Company’s professional teaching artists ensure dynamic lesson delivery and maximum student engagement. With age-appropriate instruction and a variety of formats, you can choose the option that meets your objectives. Book a single 90-minute workshop, a full-day intensive, or a weeklong engagement culminating in a performance. To adjust program length or customize content to address a specific issue or content area, just ask! We are eager to work with educators and parent teacher organizations to meet the unique needs of your school community. Together, we will make a dramatic difference! Classic literature comes to vivid life through plot and character analysis, scene study, and dramatic enactment! We unpack the works of Shakespeare and great American authors to deepen comprehension and help students integrate developing knowledge and ideas. Success in school and in life requires deft improvisation! We use the tools of our trade to develop real-world skills like problem-solving, collaboration, critical thinking and communication. This workshop focuses on building a strong and vibrant school culture. Behind the scenes of theatre artistry abounds! From make-up, masks and costumes to lighting, sound, and sets, we engage students in design and construction projects that tap their creativity and develop their fine arts and technical skills. Travel costs of 56 cents per mile are charged separately. Lodging may be required for multi-day residencies. Additional fees may apply for customized workshops.